X018 reveals continue rolling through, and tha latest should whet the appetites of fans of BioShock as well as System Shock 2. Void Bastards is a brand new title being spearheaded by the director of BioShock, blending strategy and shooter elements into a sci-fi game with crisp cel-shaded visuals. The core pitch of Void Bastards is a doozie: set in the vast and perilous vacuum of deep space, players will have to lead a group of Void Arks prisoners through the countless dangers found scattered about the Sargasso Nebula. The game looks to include several different mechanics, including a roguelike design inspiration, FPS combat, ship flight, crafting, survival, scavenging, and more. Check out the latest footage of the game featured below. The cel-shaded aesthetic is certainly we don't see much of these days, and the 15-hour campaign should offer plenty of replay value thanks to the game's focus on learning hazard locations and ship layouts through repeated deaths. Progress isn't really lost — instead, when the player falls, a new prisoner will step up to the plate, with all crafting progress being carried over. 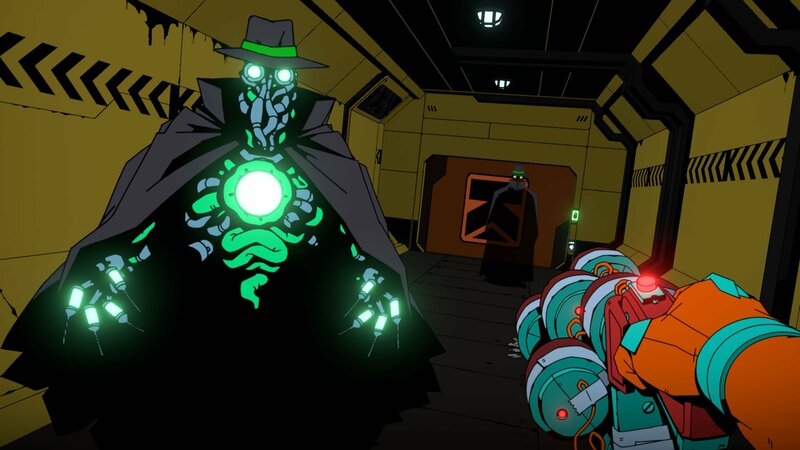 Void Bastards is slated to land on Xbox Games Pass when it makes its eventual debut sometime in early 2019. Players can find more information on the official Void Bastards website. For more X018 highlights, keep it tuned right here to Shacknews. Too much puke green but otherwise looks pretty cool! who is this BioShock director? Ken Levine was probably chief creative. Anyways, director titles in games are murky, you can have many many directors working on one game. he was the front man but Jon did a TON for the franchise. no one out of australia was really heard of on a large scale. Jonathan Chey worked at Looking Glass Studios and was a founding member of Irrational Games along with Levine and Robert Fermier. He was also part of the first team at Irrational's Australia studio. A year or two after BioShock he bailed from Irrational wanting to do less management and get back into the guts of game making. In 2013 his new indie studio Blu Manchu released Card Hunter. There's a bunch of talented folks there but of course a a few other Looking Glass and/or Irrational vets, including Ben Lee who was the art director on Freedom Force and Dorian Hart who goes back to Ultima Underworld 2 (and did level design in Thief). And now they've announced Void Bastards. An additional note about the new team is their writer Cara Ellison. She has done quite a bit of writing outside of games but about games (PC Gamer, RPS, and The Guardian along with for-hire stuff), and was recently a narrative consultant on Dishonored 2. I know why the marketing would play up Bioshock, but really Freedom Force is one of the best games ever. That’d get me to sit up way more than Bioshock credentials. I too love Freedom Force, it makes me sad how difficult it can be to get it and its sibling running reliably these days, but they're worth the effort. "From the project lead and lead artist of Freedom Force and Freedom Force vs. the Third Reich: Void Bastards!" I still have discs in boxes. There isn’t any current version???? They're both available on Steam and GOG, but they have unresolved issues. Though I don't have them on GOG,zero and it's possible they work slightly better from there. But on one of my computers FFvtTR crashes on most level loads, but you can start the first mission every time and save game loads as long as they were made from after the mission start menu. On another computer it works fine but the first one has some off behaviors. Though for some folks they both work without issue. Win7 might work better, but I can't personally confirm it. Wow, I uh, should have done a full re-read ",zero" indeed. That’s often my thought if something new comes out and it isn’t on the switch. These games are better off waiting on switch IMO. Isn’t Nintendo’s certification process the hardest? It will be interesting to see if Nvidia makes another Tegra chip that can be configured for another mobile device. I'd think Nintendo would want a hardware refresh in 2-3 years without breaking compatibility. Is Jon Chey a Chatty regular? Because I made a post about this very idea years ago--- turning FTL into a first-person shooter. Anyway, it turns out that it was a good idea. This looks great. You're welcome! Wow, a game I’m actually excited about. That looks incredible. Ken Levine said it’s been his go to game for weeks. I can’t wait to try this one.